It seems like every time I browse my local bottle shop there’s a new whiskey on the shelf. Every rare once in awhile, one of those bottles just happens to be a new Wild Turkey. Typically, it’s a limited edition, single barrel, or maybe just a new label for a standard expression. Well, a couple of weeks ago I walked past the Turkey shelf to find a brand new Rare Breed, batch 116.8. Not only was it a new batch, but a new bottle design altogether (glass and label). I’ll have to admit – I hesitated. After my experience with Rare Breed 112.8, I was nervous about the purchase. Super-premium expressions aren’t cheap, and with Russell’s Reserve Single Barrel sitting right beside it, definitely a mental tug-of-war there. But hey – have I ever been one to turn down any new Wild Turkey? Surely not. In fact, my blood type is WT-positive and my heart beats a steady 101 BPM. Rare Breed 116.8 … welcome to your new home. Before I review, let’s examine the details of this latest Wild Turkey Rare Breed. First off, the proof is obviously higher. In fact, it’s the highest ABV Rare Breed batch to date. Second, batch 116.8 states “distilled and bottled by Wild Turkey Distilling Co.,” a change from previous batches which read, “bottled by the Austin, Nichols Distilling Co.” And finally, RB 116.8 has a completely new bottle shape (same cork, though) with a redesigned label. While an improvement over the aesthetics of the former batch, 112.8 (as well as a brief run of 116.8 in the older bottle), it’s still not quite as visually appealing as the classic 01-99 and 03RB label designs. So, now it’s time for the true test. Bottle designs, labels, and specs can only offer so much. Besides, whiskey isn’t made to be displayed or admired. It’s made for sipping, savoring, and sharing. Anything outside of that and you’re missing the point. Overall: Well, Son of a Turkey … I’m sincerely happy I moved past my initial hesitation and picked up Rare Breed 116.8. This, folks, is a big strut in the right direction. At its core, this bourbon shouts modern Wild Turkey in profile, but it’s all the best parts of modern WT. Gone are the thin, sharp, and grainy attributes of batch 112.8. Instead, we have a profile that fits somewhere between WT 101 and Russell’s Reserve Single Barrel (uncut to boot). And boy is it fruity — fruity with a huge dollop of complementing spice! So what changed? What accounts for the differences between Rare Breed batch 112.8 and batch 116.8? I’m not entirely sure, but I can offer a theory or two. Per Eddie Russell, “a little” of the youngest whiskey in batch 116.8 comes from the new Wild Turkey distillery (operational as of 2011). While I’m doubtful its volume is large enough to make a significant profile impact, it’s at least in there and that says something. For some of the youngest whiskey in this batch (the de facto weakest flavor element in terms of complexity) to have come from the new facility … very good news for the future. But the new distillery is merely a fraction (if any) of the difference between batches 112.8 and 116.8. I believe the primary factor of difference boils down to improved barrel selection. It’s my opinion (no basis in fact, just theory) that Eddie is selecting barrels that fit more of the Russell’s Reserve profile for Rare Breed. Be it increased maturity or more intense complexity (or both), Rare Breed 116.8 tastes closer to Russell’s Reserve than any batch prior. If that’s the case and remains so, I’m fine with it. I’m really fine with it. In closing, I’d like to stress (again) that Rare Breed 116.8 is a notable step above batch 112.8. That means if you’re already a fan of 112.8, you’re certainly going to like 116.8. If you aren’t a fan of batch 112.8 (similar to my experience), I’d suggest keeping prejudice from clouding your judgement. Rare Breed 116.8 is an undeniably tasty and thoroughly enjoyable barrel-proof bourbon whiskey. In fact, I’m giving it a well-deserved 3.5/5. Yes, that’s the same rating I gave batch 03RB. I understand that may ruffle some Turkey snobs’ feathers, but it’s my honest opinion. While their profiles may be different (i.e. classic vs. modern), I think I might actually enjoy batch 116.8 over 03RB on a more regular basis. That’s right – Rare Breed 116.8 is now officially a regular in the Rare Bird home. Talk about a parallel universe…. I saw this 116.8 rare breed for the first time today and thought to myself let’s try it…and I am very pleased with the new addition. I’ve been sampling the Russels’ Reserves, Knobs, etc.. and then this Rare Breed appears on a shelf in a Montgomery County, MD. run liquor store!!!!! The bourbon has a beautiful vanilla candy scented nose…it is just delightful to breathe in.. the neat 116.8 bourbon in a snifter!! Wow! The initial sip just dissolves in your palette and lets you know this is a luscious complex bourbon. The hints of barrel, fruits, and spices are appropriately blended to give a super clean finish, leaving one smacking their lips wanting for another sip of this 4.5 star gem from the distillers of Wild Turkey. Glad you enjoyed it. Have you tried Russell’s Reserve Single Barrel? If not, it should be the next thing on your list. Arguably the best core expression coming out of Wild Turkey right now. Thanks for commenting! I certainly have tried the Russell’s Reserve Single Barrel, it is as you write, an excellent expression of the Wild Turkey spirits at this time. It is good time to stock up on these two, who knows how long they will be available. 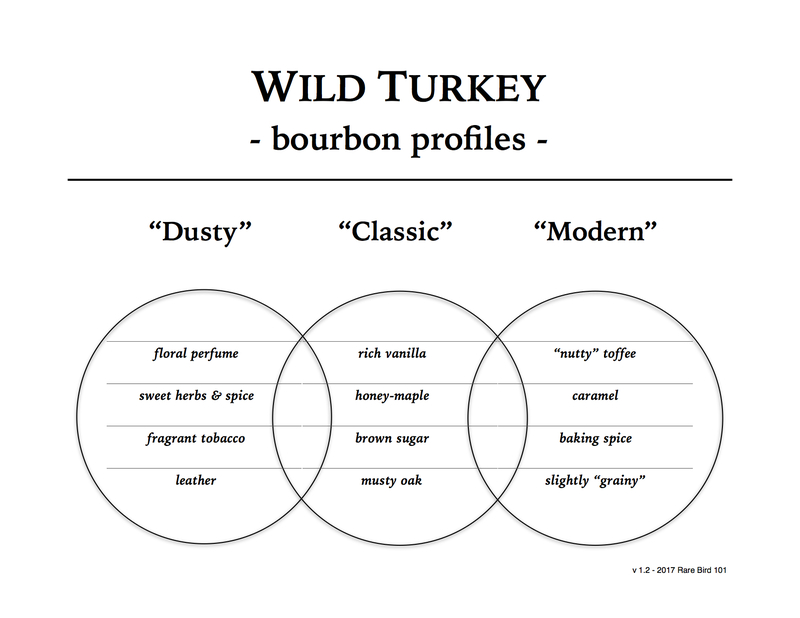 I have been enjoying Wild Turkey 101 since 1963. Recently picked up a bottle of Rare Breed 116.8 and found it to be with a fine personality even at that proof. I personally drink it NEAT. Neat is the way for me as well. But really, however one enjoys their Turkey is perfectly fine with me. Glad you’re liking the latest Rare Breed! And I agree – it sips very easily at 116.8 proof. You hit the nail on the head on this one. I have been crazily trying to find another square labeled 116 to no avail. I sampled it in the store and my sales guy let me have the rest of the bottle. It’s fabulous juice for sure! Glad you’re liking it and thanks for commenting. RB 116.8 is definitely a step in the right direction from RB 112.8. Cheers! BTW, how does one obtain a Rare Bird Glencairn? I totally agree with you on this one! Great review! 112.8 is good, but the new 116.8 really “knocks it out of the park” (way better). Only just now showed up for sale here in Europe, and a steal at 30 Euros! The best Bang for the Buck (or Euro for that matter) ! Yep. It’s an excellent deal. Thanks for commenting! Great review. I agree that this batch is superior to the last one. Perhaps you can answer a question about it that I couldn’t get a direct answer from Campari. Will every bottle of each release of Rare Breed be the same batch? That is, is 116.8 all one large batch and will every bottle with that batch label be the same? I’ve heard some claim that there are multiple batches of each proof release and that WT waters them down to 116.8, 112.8, etc. Campari says RB is barrel proof and uncut but, as I understand it, those are not legal terms. Thanks. Thanks for commenting! See my review of Rare Breed 2009 v. 2012. All will be revealed! Sorry if this has been talked about before but I purchased a bottle of rare breed 116.8 early in 2018 and wasn’t impressed at all. I just purchased a 116.8 rare breed early 2019 and it is totally different. I would have to go as far to say one of my favorites. I typically only drink anything allocated but being able to get this anytime is huge. Am I imagining this taste difference or is something else going on here? The Rare Breed’s in my area are still 2017, but someone sent me a Jul 2018 Rare Breed sample and it was excellent. I hope to review very soon. Thanks for sharing your thoughts!